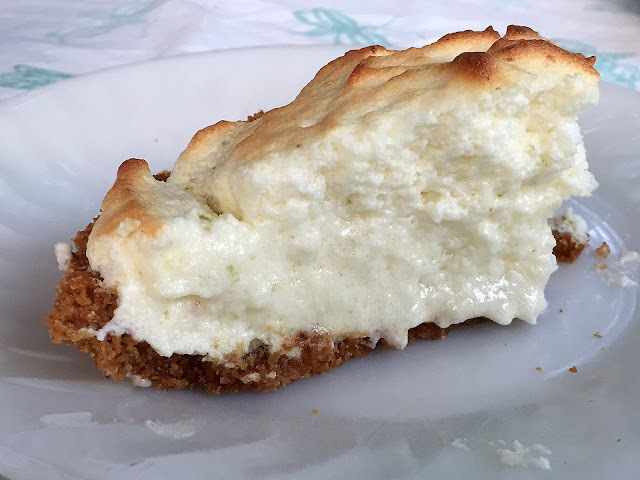 Have you ever tasted a cloud? 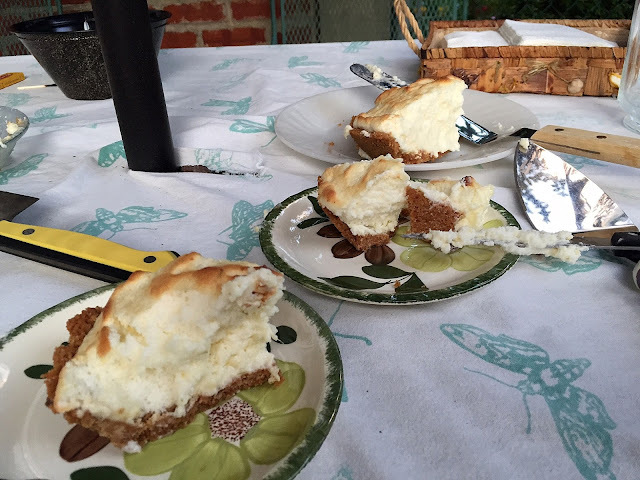 I did when I ate this lighter-than-air and beyond delicious fresh lime pie. Making it was a rather time consuming endeavor, but oh so worth it. 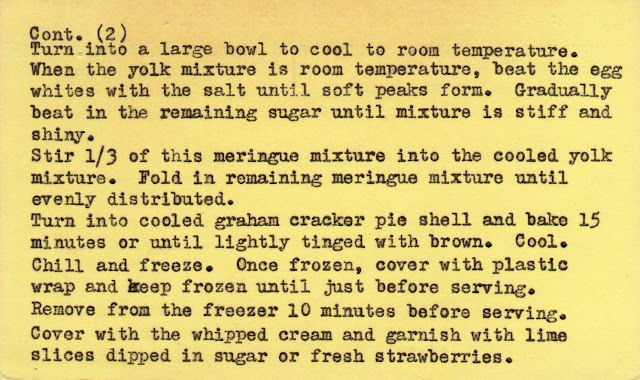 I chose this vintage recipe because it is unusual -- instead of the meringue atop the custard filling, it is folded in, which creates the ultra light texture. 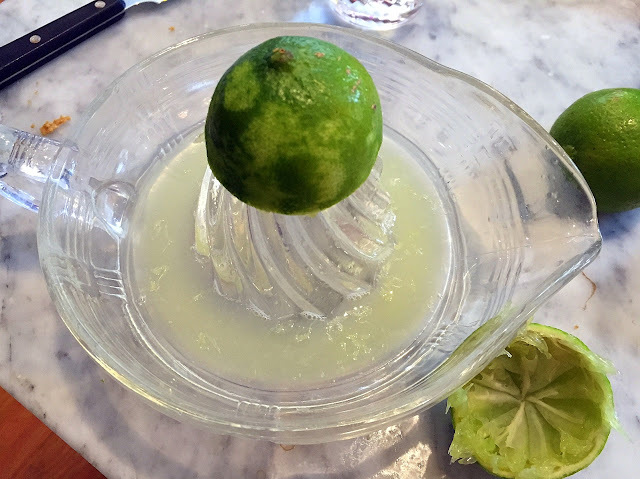 The flavor is pure lime, sweetened the perfect amount. 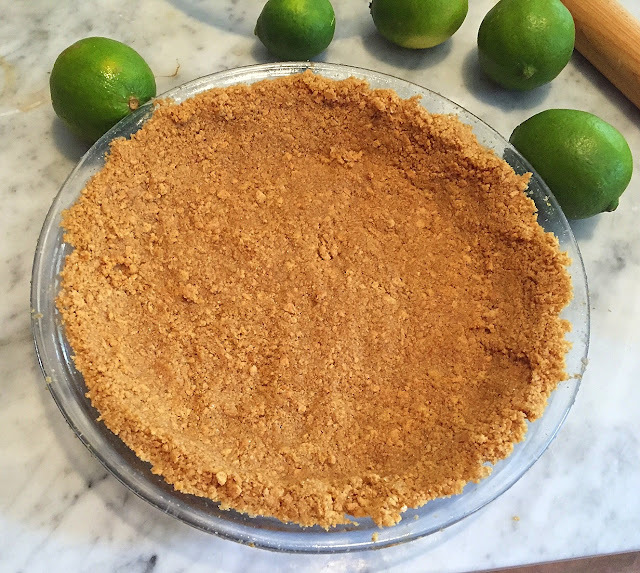 Start by making a graham cracker crust, much easier than the traditional pastry crust. 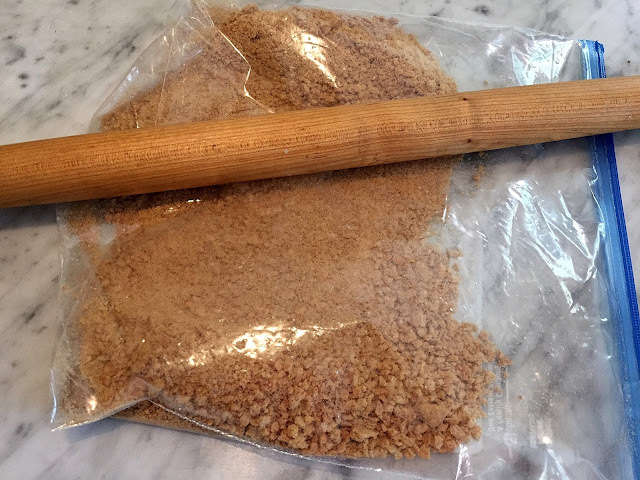 You can crush the crackers in a food processor, or do it the old-fashioned way using a rolling pin (or wine bottle). I did it in plastic bag to avoid a messy clean up. 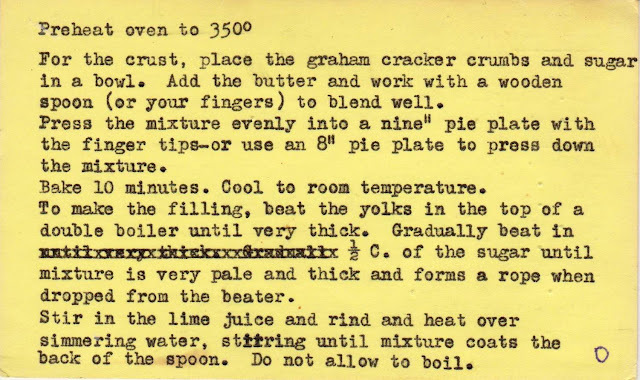 Press the cracker and butter mixture into a pie plate and bake a few minutes. Next, zest some limes. 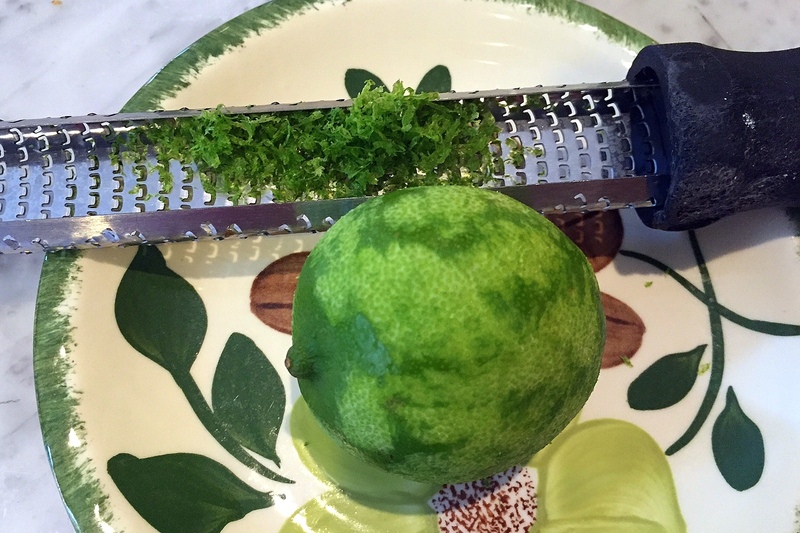 A microplane makes quick work of this. 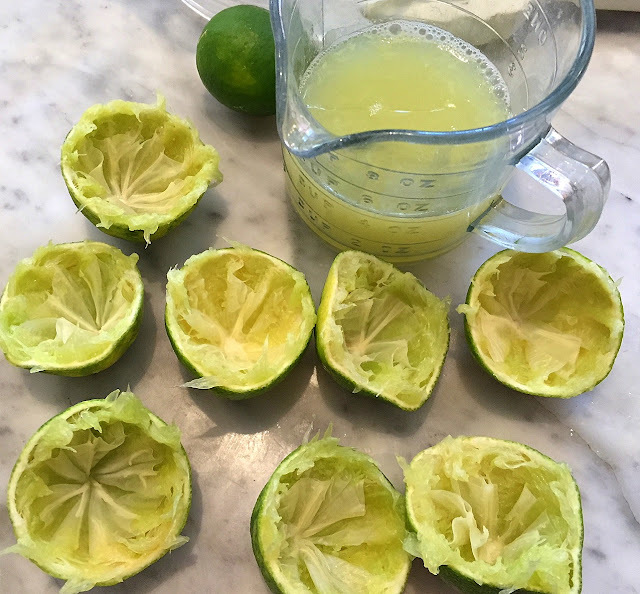 Zest first, then cut and juice the limes. 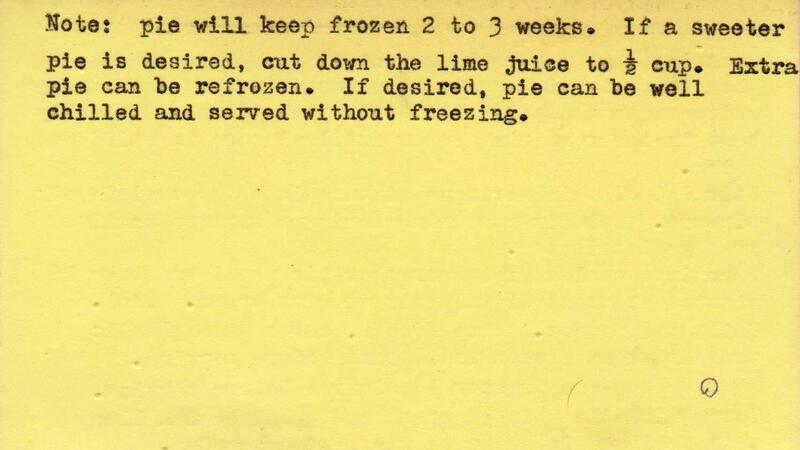 This is where the recipe gets complicated. 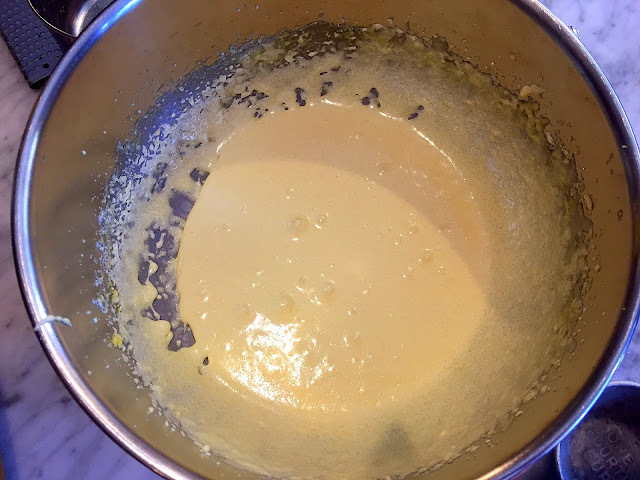 Beat the egg yolks in a double boiler (stick a bowl atop a saucepan), add the sugar and cook until very thick. 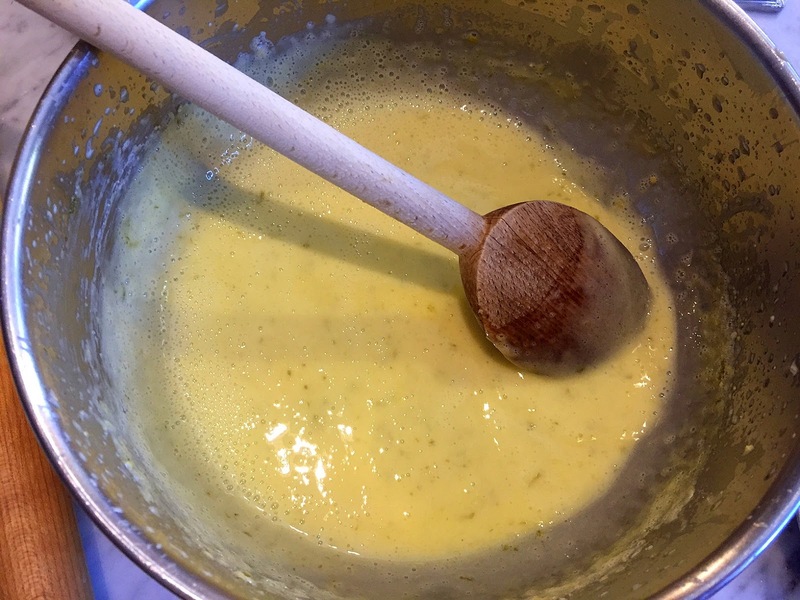 Add the lime zest and juice, and heat until this mixture gets thick. 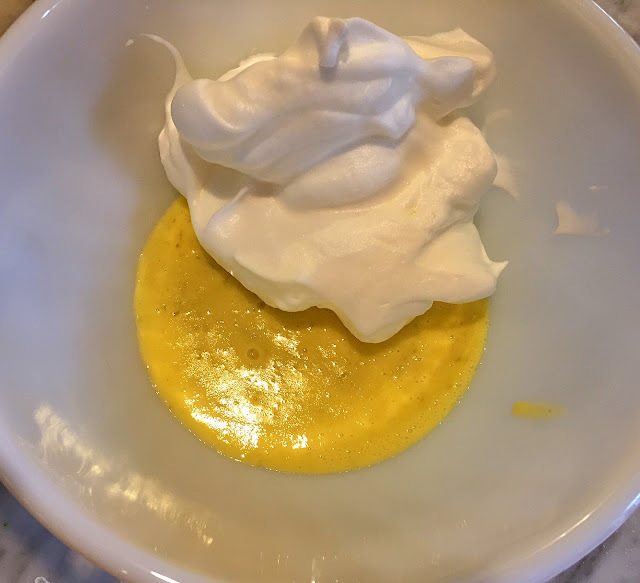 While the lime mixture is cooling, beat the egg whites with the sugar. Then, using a large spatula, gently combine the two. 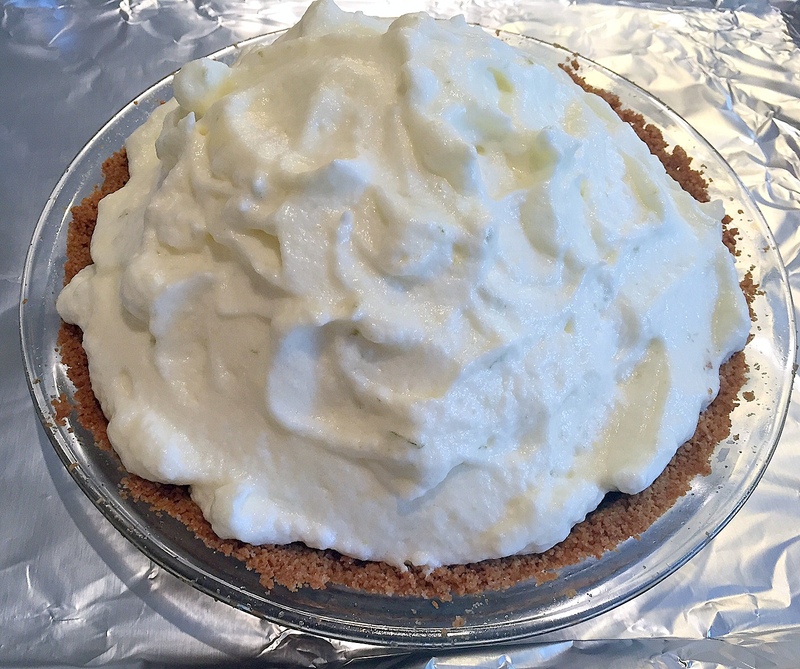 Place the filling into the cooled crust. Make some swirls so it browns nicely. Bake until the top is browned. Although I served this for company, you can see that it's a rather messy pie. But I guarantee your guests won't mind once they have a bite of this luscious lime cloud. A gift from the gods and worth the effort. 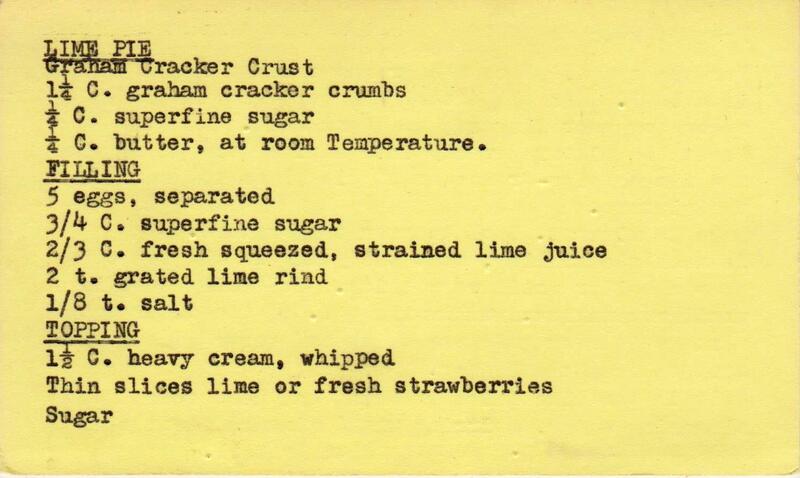 Production notes: I followed this almost exactly, but used regular, not superfine, sugar. (You can make your own by whirling sugar in the food processor for a few minutes.) 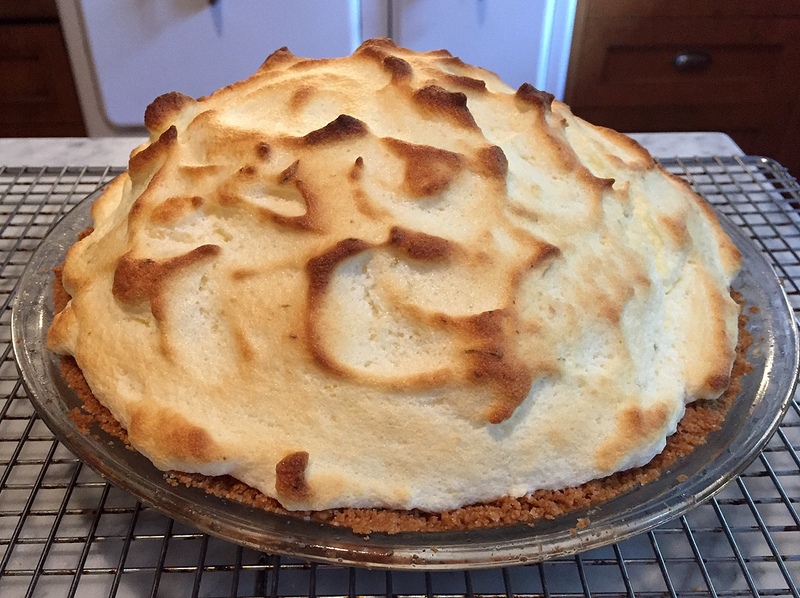 I also didn't add the whipped cream topping because the meringue looked so nice. I didn't freeze the pie -- only refrigerated it for a few hours. I also don't see how one could freeze this pie, despite what the recipe author says. Even though the instructions are long, they are very clear, making the recipe easy to follow. I think you forgot to post the picture on the back of the first card, with the initial instructions? Thanks! Thank you, Kath! I just added it.